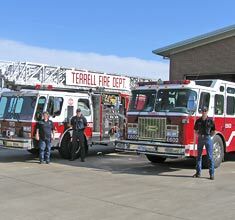 The Terrell Fire Department provides a high quality of fire protection, fire suppression, rescue, and training for firefighters. The Department’s 23 full-time paid personnel are committed to saving lives and property not only by a quick response in the event of a fire, or emergency medical call but also through fire prevention and safety education. Fire Department personnel and equipment cover the 25.23 square mile area of the City of Terrell with access to more than 1000 fire hydrants.